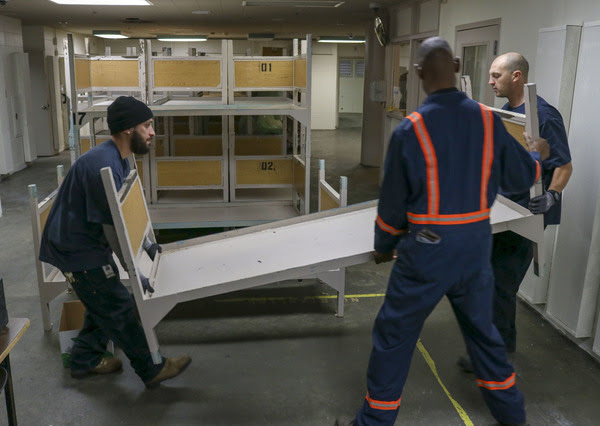 of the correctional facility in downtown Seattle into single beds for emergency shelter. King County Executive Dow Constantine issued a news article about emergency action being taken to confront the homelessness crisis in our region. We are utilizing every available property, resource, and asset we have to confront the homelessness crisis in our region. We will open a temporary 24-hour enhanced shelter in the vacant West Wing of the King County Correctional Facility in downtown Seattle. The voluntary shelter will provide beds and 24-hour on-site services. We will open a shelter in the vacant Harborview Hall on First Hill for 100 adults each night while we explore the possibility of providing 24-hour access and services in the future. We purchased 20 units of modular dormitory-style housing that will help up to 160 adults make the transition from shelter to permanent housing. We will make on-site services available to help them succeed once they have a permanent place to live. We will locate the first six units of housing at a Metro-owned property in the SoDo neighborhood of Seattle. We will augment the 50-person overnight shelter located at the corner of 4th Avenue and Jefferson Street in downtown Seattle to include a day center and expanded street outreach. It will provide people who are experiencing homelessness in the Pioneer Square neighborhood access to showers, case management, and connections to healthcare. This is in addition to the former Public Health clinic in White Center and a former Sheriff’s Office property in Kenmore that we converted into 24-hour enhanced shelter for families, both of which are operated by Mary’s Place. Meanwhile, we are continuing to work with cities, businesses, nonprofits, and philanthropies to tackle the root causes of homelessness: the lack of affordable housing region-wide, inadequate access to behavioral health treatment, negative impacts on youth involved in the child-welfare system, prior criminal justice involvement impacting the ability to obtain housing and find employment, and education and employment gaps that make housing unattainable. We will succeed by simultaneously providing emergency shelter to bring people in from the cold, helping more people transition to permanent housing at a faster rate, and preventing children, youth, and families from experiencing homelessness in the first place.